Whew! 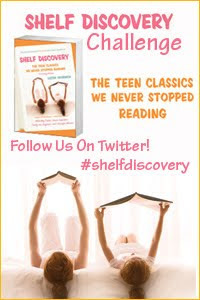 This is the last of my reviews for Kathy's Shelf Discovery/Judy Blume Mini Challenge. I aimed to read all nine Judy Blume books featured in SHELF DISCOVERY, but I fell a little short (I only read eight and missed out on WIFEY.) FOREVER was the last book that I picked up to read; not because I didn't want to read it, but because I was afraid to write a review about it. I'm sure you're somewhat familiar with FOREVER -- it's Judy Blume's book about a teenage girl's first time! FOREVER is another Judy Blume book that I might have missed as a girl. I almost don't think that's possible, but maybe my parents were doing a little censoring (but then you'd think I'd remember that too.) Maybe I read the book when I was too young to appreciate those teenage feelings? For whatever reason, when I sat down to read FOREVER, the story didn't come back to me like I was expecting! FOREVER is the story of Katherine, a teenage girl who meets Michael at a party. She is a relatively, inexperienced naive girl who ends up falling head-over-heels in love with him. Katherine and Micheal begin to do "normal" teenage things, and their feelings (and actions) quickly escalate into Katherine's "first time." I enjoyed FOREVER, but I don't think it was my favorite Judy Blume book (or even one of my top five.) Maybe now that I'm a mother to a daughter, I just don't want to think about all of those teenage hormones/feelings! I did appreciate this novel though. I don't know how Judy Blume manages to do it in every one of her books, but she has the amazing ability to capture the essence of a teenager like no other author I've ever read. In fact, as I read FOREVER, I remembered all of my teenage feelings. It was almost as if they came rushing back to me through Katherine's words. FOREVER was really about young love, and I was almost surprised by how realistic Ms. Blume portrayed these feelings in this novel. I remember thinking at 17 that I was going to marry my high school sweetheart (don't even get me started on how thankful I am that that never happened); and despite my parents words of wisdom, I knew our love would last "forever." While I enjoyed reading about Katherine's and Michael's relationship, I really enjoyed the ending of this novel. Katherine's parents found her a job at a summer camp, and she had to move away from Michael for the summer. They were inseparable for the months leading up to the summer, but when Katherine was away from Michael, she found that she was attracted to another guy. I thought this part of the book was so realistic, and Katherine's feelings were so honest. This is exactly what happens to almost every teenager who thinks they are in love, and it is nice that Ms. Blume shows that this is normal. She also shows through Katherine that while it may not be easy to breakup, it is okay and you will survive. Another thing that I appreciated about this novel was the presence of Katherine's parents -- this probably has something to do with me being a parent myself, but they were involved in their daughter's life. They actually seemed to be in touch with their child. And, they were aware of what was coming. They tried to warn Katherine about becoming too serious with Michael. They even told her she didn't need to be tied down to one guy, and I could almost see them flinch when she mentioned "forever." Had I read this as a teen, I probably would have thought that they were so mean and unfair. But as a parent, I knew they were just trying to give her another perspective and protect her from the pain of a breakup. I don't think I'll be handing off FOREVER any time soon to my 10 year old daughter, but I am going to put it safely away on my bookshelf. I think in a few years she might want to read it, and I hope that FOREVER may be the type of book that will open the door for communication between us! This one played a big role with my youth, second only to Margaret. (My parents had no censorial role in my reading...they had no clue.) I read this when I was going through all of those emotional disasters, so I was pretty moved by this book. It was describing exactly how I was feeling. Will I give it to my 12 year old any time soon? Not a chance! It's obvious that I'm going to have to go back and read more Judy Blume books. She sure does tackle some tough issues! Great review, as always! This book reminded me so much of my late teen years, and how frustrating it was for my parents to try to tell me that these young crushes were not necessarily the "forever" kind. Needless to say, I, a mere high schooler, thought I knew better, only to discover of course they were right after all! I didn't read this book when I was younger. I don't remember my mom "censoring" an books but I probably just didn't think it appropriate. I don't know. I feel guilty I've only read ONE book for this challenge. I have three sitting right here too. I'm going to try to get it done by April.